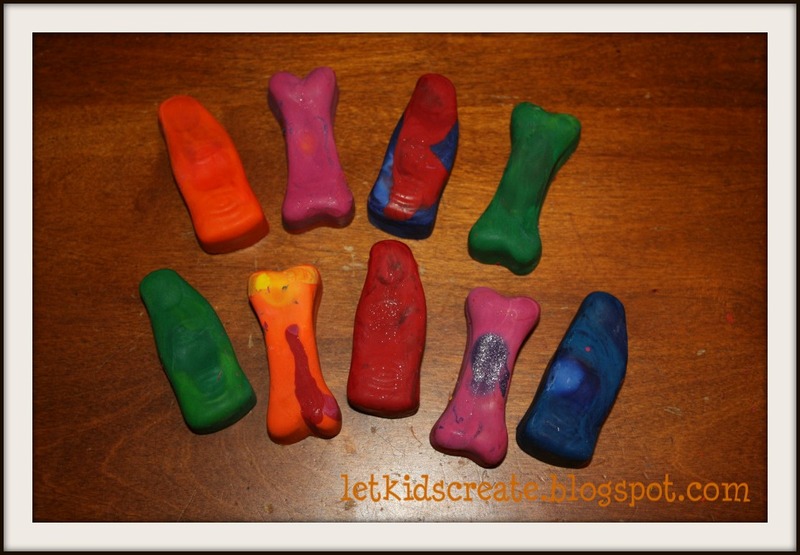 I was at the dollar store and saw these cute ice cube trays and thought I could make some festive bone and finger crayons. 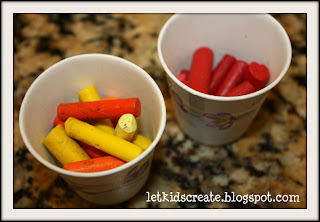 First, I had Maisy and Mina separate our broken crayon collection into color groups and put them into mini paper cups. Mina really just wanted to dump all the colors into one cup so I helped her a little. Although I realize now how fun and much more interesting multi-color crayons could be. Then I microwaved them for around 8 or so minutes (I checked on them every 2 - 4 minutes). Once they were completely melted (a few of the colors actually had a chunk in them that wouldn't melt, but I figured it wouldn't matter too much once they cooled anyway) I poured them into the ice cube molds. Don't leave them sitting for one second while your head is turned! Lou came home from school and Maisy was so excited to show her what we were doing that she went and dumped half of the melty stuff right out. I'm glad it really wasn't too hot, I had actually already dumped a little on myself while checking to see how they were coming along in the microwave and it didn't burn my skin at all. It dried the second it touched me. Somehow Maisy didn't even get any on her. 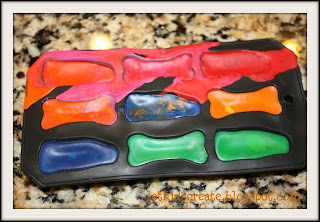 Ok, so I finished pouring the melted crayon into the molds and put them in the freezer for around 30 minutes. Then I was able to pop them right out. These should be fun to color with! Linking this post to NurtureStore Play Academy. and JDaniel 4's Mom Halloween Traditions. These are great for halloween. They would make a good little "Boo" gift. 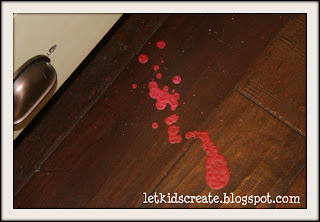 Thank you for linking up with the Afterschool Blog Hop! I had an "aha" moment when I read this post. We tried making our own crayons last year and I melted a few ice cube trays in my oven =( No idea why I hadn't thought of melting the crayons and pouring. Looks sooo much easier! I have this same mold! Never thought to use it for crayons - fabulous! I'd love for you to share in my Halloween linky party beginning Tuesday at midnight! These are so fun! We have a crayon maker but haven't busted it out yet. I'm sure my boys would love to make these even more - thanks for the idea! Hopped over from Not so Tough Tues. How creative is this? I am always looking for fun new ideas to do with the grandies. I would never have thought of putting crayons in the trays. Thanks for sharing! Now a new follower. these are such fun! we've been wanting to make these for a while, but i wanted to do it in the summer sun... guess we'll nuke 'em. looks like they turned out to be super fun! over from Our Country Road and am your newest follower!! these are cute! 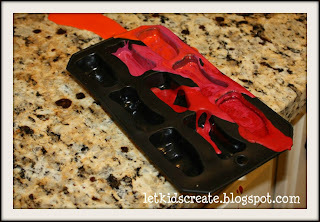 I wish I had the mold - these would be perfect for the goodie bags I put together for my girls classes! Thanks for sharing on last week's Sunday Showcase. I hope to see you share more of your fun ideas this week. I have this same mold, along with the pumpkin and skeleton ones. I was wanting to use them to make crayons, but I've only ever made crayons in the oven. I knew these molds wouldn't be good for that and worried that pouring the crayons would be a huge mess. But, now that I've seen it can be done, with only a slight mess :P I'm excited to make some! Thank you so much for sharing!! Great way to use your ice cube trays!! These would be such fun to color with.